Belligerent Rejectamenta » Who the Hell Am I? 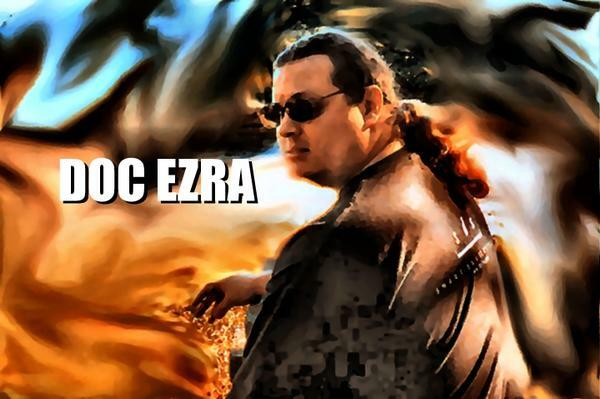 Doc Ezra is a man of many talents. He’s been a bounty hunter’s sidekick, a professional temp, handler of millions of dollars of gems, aide to a child psychiatrist, and a college English professor, but he currently splits his time as a writer for NASA and a reviewer of literature and film at Needcoffee.com, where he has been on staff for over a decade. He possesses a near-encyclopedic knowledge of bad action movies, funny dice, and video games, and has written his own weight in book, game, and DVD reviews. He has also served as a former contributor to RPGAction.com and Corona’s Coming Attractions. Doc is a paleogamer, keeper of obscure lore, practicing Discordian, and an all-around swell guy. He currently lives in the Library of Babel with his wife and cats. Doc wants to assure you that he has no living enemies. just read M80’s and High Dives. Well thought out and nicely put. We have all been in this same place and i believe you have done well at expressing your loss with wonderful colorful memories. I’m glad you liked it, and thanks for stopping by. Do you happen to have it still? I don’t still have it, but check your email for the contact info of the gentleman who created it and he should be able to hook you up.